Chechen rebels killed eight Russian soldiers and four pro-Moscow police in a double ambush in the restive province, security officials said on Tuesday. The rebels attacked the policemen when their vehicle hit a mine near the town of Urus-Martan on Monday, a Chechen police spokesman said by telephone. An armored troop carrier with eight interior ministry troops went to their aid, but ran into another mine and also came under fire from the rebels. In Moscow, a spokesman for interior ministry forces confirmed eight Russian servicemen had been killed in the ambush but he had no word on Chechen police casualties. The Chechen police spokesman said seven people were wounded in the clash, but could not specify whether they were Russians or Chechens. In 2000 Russian troops ended a short-lived independence for Chechnya won in the first war with Russia in 1994-96. 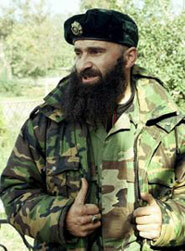 But Chechen separatists have kept up a guerrilla war against Russian forces. Chechnya's pro-Moscow president, Akhmad Kadyrov, was killed on May 9 by a bomb at a tightly guarded stadium in the regional capital Grozny.